So what is a Farmstead Cheese? I like to think that this was the the cheese that our Grandmothers made on the back of the stove; a simple and to the point means of preserving milk during the peak of the season when there was a bit of extra milk. There was a time when our ancestors lived mostly on farms and grew or made most everything they used or ate. Our grandmothers may have made cheese on the back of the stove (or their mothers or mothers' mothers etc.). If you have discovered home cheese making recently, this may have been one of the ideas that led you there. Until about 1850, cheese making was a local farm industry. 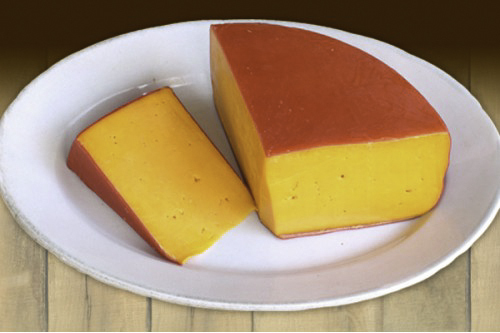 Farm wives made cheese from the extra milk and sold this at farmers markets (sound familiar? Fast forward to the 21st century and our current quest for REAL food). This would have been the cheese made by folks having one or two cows, enough milk for the family and cooking and at times enough to make a few cheeses to preserve the milk through the cold season until the cows freshened again. These would have been small farms and even in-town families. In fact the old house (1852) with attached barn in the village where I live here in the northeast had several stalls, including 1 or 2 for the cow(s). One of the first cheese making books that I ever read was by John Ehle titled "The Cheeses and Wines of England and France with Notes on Irish Whiskey." Now what is not to like about a book with a title like that? This was, and still is, one of my favorite books to read on cheese making and the way it was done. I find myself going back to it quite often, it is just done so well. It was written back in the 1980's, and was soon out of print, but I managed to find a copy. I knew that Ricki had talked with the author about reprinting the book and had received permission to republish it. About a year ago, she reprinted it making it affordable for all! (I get no commission for saying all of this, I just love this book)! The first chapter in John Ehle's book is about a visit with a traditional 'back of the stove' cheese maker in the mountains of North Carolina (already he has digressed from the title!). Mrs. Kirby is her name, and it seems that she has been making cheese this way for some time. Mr. Ehle spends the day with Mrs. Kirby and gets a table/stove side view of how it has been and is still done. The storytelling is every bit as good as the information on cheese making itself. The other source of info was a US Dept. of Agriculture Bulletin (no. 1734) printed in 1934, "Making American Cheese on the Farm." This was a small brochure to help the women in the kitchen make a good quality cheese. The process was very similar to what Mrs. Kirby was doing above. 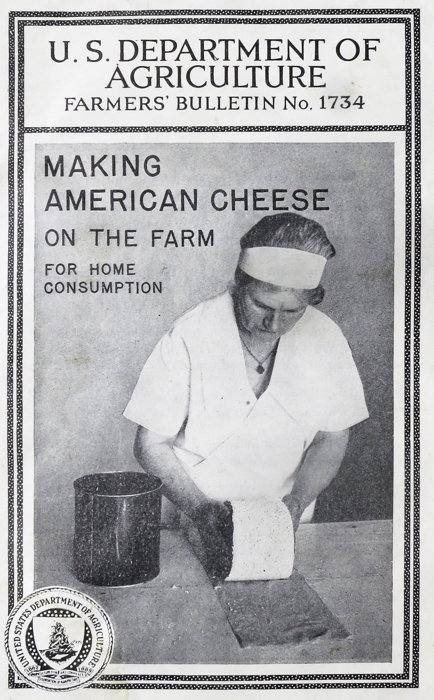 The brochure was focused on aiding the farm/house wife in making a successful cheese that could be aged for family use during the cold months when the cow was dried off. 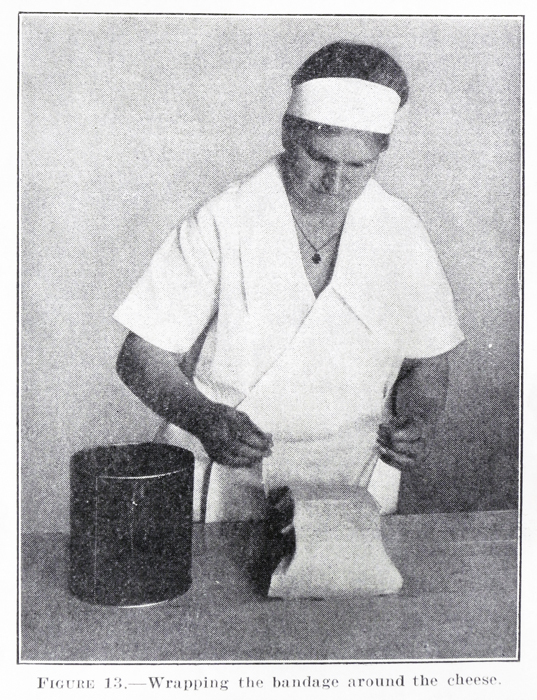 The brochure was simple, yet quite detailed, and took the reader from milk source to the final bandaging and aging of the cheese. They tended to be made in all different sizes and weights. Some were colored to a medium or even bright orange, others had no color added. They could range in moisture levels and potential for aging in the cool room or cellar. They could be heavily pressed with a close tight texture, or lightly pressed with some openness in the body. Some were waxed and some were wrapped and pressed with a cloth bandage. So, as you can see here, the cheese could be whatever the maker wanted. However, they all seemed to know how to ripen the milk and curds properly, and to dry the curds enough before pressing to avoid spoilage. We do suggest for the initial trial to stay close to the guidelines and take lots of notes, and then venture off in future cheese making sessions, after you have tasted the cheese you have aged.